Preheat oven to 425 degrees F. Line baking pan with foil and coat with nonstick cooking spray. Brush chicken with mayonnaise. Place bread crumbs in a gallon size resealable bag. Place one chicken breast into bag, seal and toss to coat. Remove chicken and place on foil-lined pan. Repeat with remaining chicken. Bake for 20 minutes or until chicken is thoroughly cooked. When chicken has 10 minutes left to cook, begin preparing Alfredo-Broccoli according to package directions. 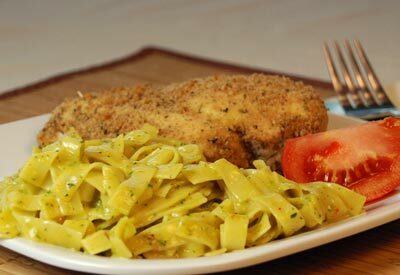 Serve chicken breasts and Alfredo together while nice and hot.